Happy Easter! Slow week at the stores, plus took 5 days off from hitting up any stores at all this week, so just a few finds. I've already got one of these vintage Enesco napkin holders, but I collect the set & from what I can recall my other one has a small chip. I passed up a set of 4 of these 1989 DC Comics Batman glasses at an antique market in London in the summer, regretfully, but am happy to have this one from Value Village. The Amazing Spiderman large badge from Marvel Entertainment Group, INC. I believe late '80's. Made in Mississauga. Also made in Canada, all these cards. 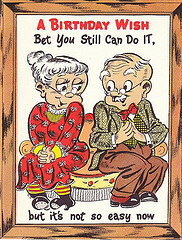 Not sure about the vintage Valentines Day cards, but the birthday card is by Rustcraft. I get a kick out of the Knock Knock stuff, but it's just too expensive at the retail shops unless you're lucky enough to score it in the discount bin. I come across a lot of unused Knock Knock (& Fred) products... found these & thought these post-its would be fab to bring to work. I found this wallpaper at Goodwill, thought maybe, one day, I could do something will it...too cool to pass up. 1994 Sonic The Hedgehog flat sheet by Sega. Seems like it's a bit rare, couldn't find one that ended or is listed on eBay. Didn't search too long in Google, but didn't see one there either. Love adding something uncommon to my collection. Linkup below with you're thrift finds if you're not too busy eating & hunting for eggs! Happy Easter! 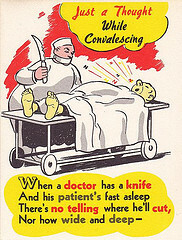 Here is a small selection of vintage greeting cards from 1948 by Novo Laugh. 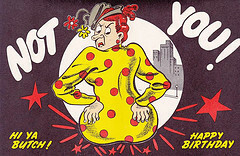 Pretty risque... Vintage greeting cards are my OBSESSION right now. It's my stop in the thrift after Pyrex! These ones I bought off eBay for a really, really good price. 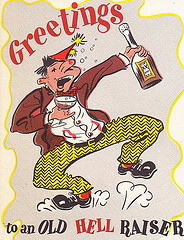 Do you buy vintage greeting cards from the thrifts? Do you actually use them for their intended purpose? If not, what do you do with them? 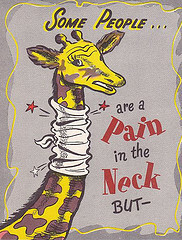 Throat so dry and throbbing head. Lost your money, lost your rep. Boy: What A Wonderful Time You Had. 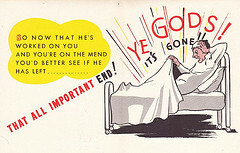 Even your darn old tongue is sore. Gosh: What A Party It Must'uv Been. Don't know where you time was spent. For look at the Helluva Shape You're In. 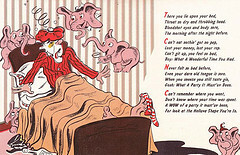 I still have more vintage greeting card scans to come (slowly), but you can always visit my Vintage Greeting Card Set on Flickr. Thrifty Things Friday> with The Thrifty Groove..
& if you follow my blog, you know I am not very fond of Glasbake casseroles & I started teasing her saying it starts with one.. Anyways, I've always wanted the Glasbake mugs, even though Glasbake pretty much disgusts me, but the Lipton Soup mugs are drop dead gorge. I wonder if someone from Lipton (or a thrid party) designed them instead of someone from Glasbake? I found the aqua one in a thrift store for 99cents & Jill was sooo kind to mail me a surprise gift of the white & red mugs! Not at all what I was expecting when she sent me something. I was smiling ear to ear all freakin' day. 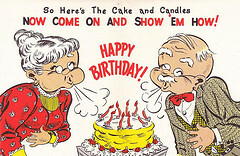 She also sent me this fab vintage cards, Made in Canada. I feel that I did a lot of thrifting this week. This upcoming week there's a holiday wedged in there, plus money is a little tight. Thrifting will be light, so hope donations will be heavy! I can't save the best for last this week - I'm so psyched about these salt & pepper shakers! They were in the case at a thrift shop - $29.99 about 2 months ago. I passed. They were still there, marked $19.99. I passed, but then with all my purchases from the store, my 30% off card was filled, so I gave. So happy to add them to my collection - they are adorabs! I'm not sure who makes them, can you tell me? This Pyrex Cosmopolitan lid got me hot. I desire this piece of Pyrex. I passed on the piece at an antique market in Michigan with a clear lid for $12, never in my life would I have thought I found the lid, which is why I left it. Never underestimate the thrift store, I guess. Now, just need that bottom. Grab bags are my weakness. 1980's was pretty big this week. I found the Gremlins at 2 separate thrifts - one alone for $2.99, one in a bag with a 1971 Pillsbury dough boy & his lady (she was amputated & missing a piece of her head) for $1.99. One of the best grab bags ever - Teenage Mutant Ninja Turtles & Barbie lunch bags, 1980's Popples & Transformers & Cabbage Patch Dolls party hats (everything from the 80's is bring brought back - bring back the Popples!) & one lone Alf blower all for $1.99. Was so happy! Along with the Cosmopolitan I am glad Pyrex is back in my life in larger quantities. I also picked up a 403 Butterprint mixing bowl, a little more beat up than I usually find, but utensil marks are nothing these days, are they? And a beautiful Horizon Blue Bake Serve & Store. Along with the 1971 Pillsbury Dough Boy (got the newer version, too & his lady) & a 1997 tea towel. Fire King mugs. The clerk at the thrift got a little nostalgic & told me how her mom always said that her coffee tasted better in these mugs & said, I guess old people are set in their ways. I told her, that it's true. She should buy one try it out. The red checkered is one I missed out on at the Goodwill auction last week! Some little randoms pulled out of grabs bags where the rest was donated back. Jurassic Park party plates (OK, we kept all the napkins, paper plates & stuff to use, but I only wanted these plates), some Post-it Lemon scratch & sniff (I am wondering if it would be better to sell these as single sheets or as unopened packs? 1989. ), one lone vintage birthday card, but the lion has better hair than I ever will & doesn't that made in Italy journal got the most amazing graphics? Lastly, this poodle tea towel. The thrift marked it up.. being vintage, but I used my 30% off card for this, too. Anyways, god, I bought a lot this week. I didn't notice. Can't wait to see what you've bought, that is, if you link up below! Goodwill Auction: Today I took the time to visit my local Goodwill's auction - they had on the auction block a set of Jadeite mugs with saucers & the smallest swirl bowl. They also had 2 lots of Anchor Hocking // Fire King (or "Tire King" as the auctioneer declared it!) mugs. I was psyched! I passed them by & they looked like they were in ACE condition, so I didn't bother handling them outside the display case, even though it was the viewing period earlier in the week. I arrived at the auction during viewing period, but declined to view them again. I got a spot right in front of the Jadeite & first lot of mugs so not one of the 3 behind the counter would miss a bid from me. I was nervous all week my thrifting nemesis would be there - she wasn't. The Jadeite came. It was the hit of the auction. Starting at $14, it hit $40, $60, the lady who I can't stand who lives in the co-op across the street from me's cap $100 (out she stormed.. probably later to return for the jewelry, like always) & then it settled at $150 with another Goodwill Rat. I never got a bid in - oh well. My biggest interest was the mugs, I could get them at least in the same price range & without the white markings I noticed once placed on the counter & the chips in the saucers. What else could have been wrong with them as I was at least 6 feet away. When the first set of "Tire King" mugs were placed on the counter, to my disappointment, most had fading & paint removed. I had to squint, but I was sure of it. I was pissed! I've passed up nicer mugs on thrift store shelves. Starting at $10, the stalled, so I pid $12 anyways, maybe the 2 left in the case were nice. Whatever. I didn't stick around for the last lot. I would have been there for another hour. I hate being disappointed! Thriftasaurus. If you got through that, here are my finds for the weak! Not posting pics of the Pyrex by itself because we all know what that looks like! The Butterfly Gold bowl, not really my thing, but in pristine condition & the pattern I don't come across that often. I'm trying to phase out all the other bowls in the kitchen & just use 401's for everything. The other bowls annoy me! Two glasses! The Bushwackers I found last week, probably had more in the thrift & this was left behind because of a manufacturing flaw on the rim - a tiny bubble. 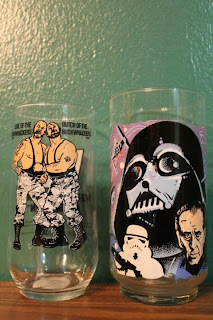 & a 1977 Darth Vader glass. Fun! This 1979 HIS towel, made in El Salvador by Saydah Collection. It looked like someone was going to buy this & through it back. Wonder if they bought HER though? I don't usually blog Sunday's, so here's a vintage (1948 Hallmark!) 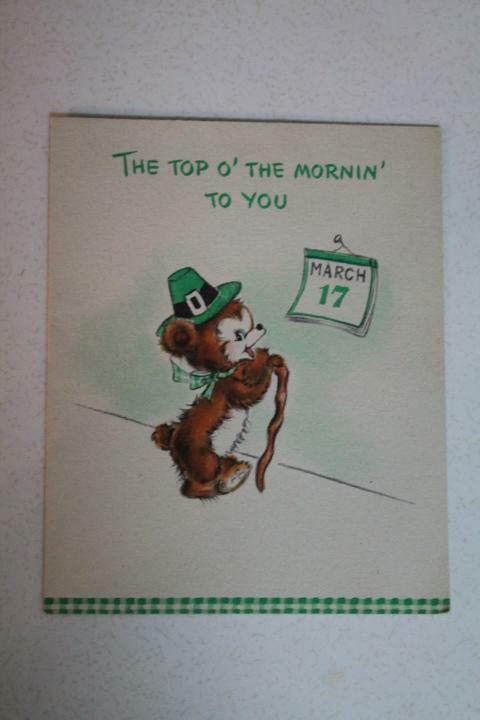 St. Patty's wish for you! Picked up at a flea in Buffalo with a few others that I am hoping to scan when I find the wires. Can't wait to see what you've all found this past week! God knows I've been out there (14 thrifts) & this is all I've got to show for it. Monkey Shines is a horror movie released in 1988. It's about it man who becomes a quadriplegic & gets a helper monkey who starts acting out his violent desires. I haven't seen the movie in years, but I was obsessed with it when I was younger. There was a video store near our grocery store where you could rent 5 of the older movies for $5 Monday through Thursday for 5 days. This, along with Howard the Duck & April Fools used to be some of my regulars. 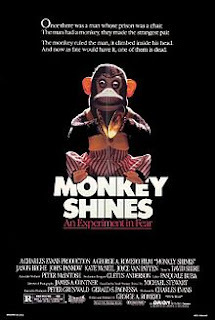 The movie poster also embodies one of my all time favourite toys - the Jolly Chimp! I have 3, all complete with boxes. When I watched this movie as an adult, I couldn't believe how silly it was, either way, I wouldn't be able to pass the shirt up if it came up at the right price & in the right size. If you've never seen/heard of Monkey Shines, here's the trailer!